3400 sq foot two story executive style living with fully furnished suites with bedroom/living room ;accomodations. Two formal living areas with two additional siting areas. Fenced yard,and sea wall acccomodations. Three and 1/2 bathrooms with laundry facilities. Fully furnished. Room Configuration: Upstairs: Captains Quarters includes king bedroom suite, queen pull out sofa, two charis, flat screen tv and direct access to jack and jill bathroom. Nautical Room, provides king bed room suite, queen pull out, two chairs and flat scrren tv. The greem room provides queen bedroom suite with a formal living room combo and flat screen tv. There is a formal living area on the second floor at the top of the steps. The Bunk room provides two twin bunks and a tv. Downstairs: Large bedroom with queen bed and queen pull out with two chairs and large screen tv. Easy access to down stair full bath off hall with walk in shower. Fully Equipped kitchen, laundry room, formal dining room , eat in kitchen and two living rooms. I provide vacation rentals in Ohio, Georgia and Florida. I have been in real estate for 39 years and current with my Ohio Real Estate License and affiliated with Zimmerman Realty, LTD at Indian Lake. The property is large and provides large family to be together and promote family activities. Private setting with Private suites for provide independency for family members with water sports events at the door step. 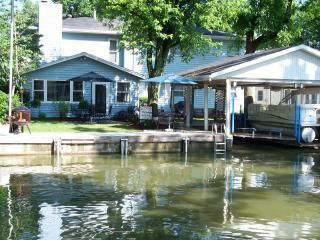 We are on the Tecumseh Channel of Indian Lake, quite and enjoyable and boat is safe from boat traffic on main lake, however a short distance to the open water. Great location on the Manatee channel. Grandchildren swam in the channel up to the time we left. The place was very spacious. I would stay here again. Great House and Great Time! As always, the house is amazing! The owners are kind and good to deal with. They even checked to make sure we were alright during a storm and power outage. Overall it was a very relaxing vacation. I would recommend this house to anyone. We strive to keep our repeat vacationers happy. We always have a great family time at Indian lake. Tecumseh Island Retreat has a lot of room for big families and fun. The house was large and clean. More than enough places to sleep. Perfect to swim and float in the canal and boat in the lake. Large home lots of room except the kitchen was a little small but not a big deal. Everything was great other than the grill left something to be desired. We had a wonderful time. Weekly Rate: $2150 - $2450 $300.00 earnest money deposit required, balance due 30 days prior to stay. Includes $150.00 for sanitation costs and 89.00 for insurance. ** No smoking in home*** Rents are not refundable, but you can reschedule for one year if for some reeason you have to cancel. $1550.00 is the minmum rental for three nights and four days.